Earworms – A Productive Application! Wikipedia defines an “earworm” as “a catchy piece of music that continually repeats through a person’s mind after it is no longer playing.” I think we can all remember a time when a song has gotten “stuck” in our heads for maybe hours at a time. There is a technical explanation for this phenomena, and it involves the part of our brain called the Auditory Cortex – the part of the brain’s temporal lobe which processes sound input from the ears. Anyway, what if this phenomenon could be put to positive use? In my attempts to learn a second language, I have stumbled upon many different methods, styles, and techniques utilizing software, mobile apps, CDs, and DVDs, and each of these methods have their own high and low points depending on the “learning style” focus. The Earworms Musical Brain Trainer is yet another method, and overall I find it very helpful in its approach. I am a musical person, and I strongly believe that associating anything with music will help us retain and remember what it is that we are learning. Likewise, this process of using simple music to accompany learning a foreign language is very helpful to helping us get the new words to be “stuck” in our heads. 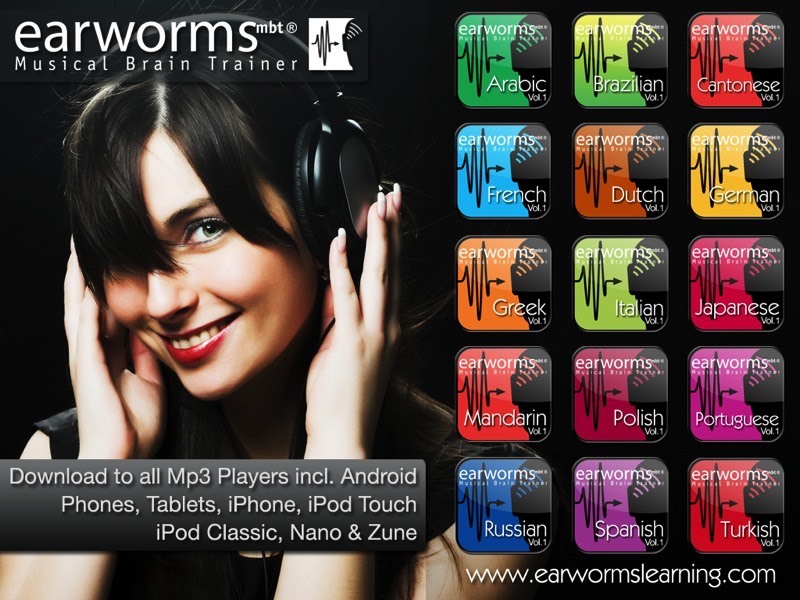 Languages currently available for Earworms Musical Brain Trainer include Arabic, Chinese – Cantonese, Chinese – Mandarin, Dutch, French, German, Greek, Italian, Japanese, Polish, Portuguese – European, Portuguese – Brazilian, Spanish – European, Spanish – Latin American, Russian, and Turkish. The simplicity of this technique, and how seamless it seemed to catch on to the phrases and words being taught. How earworms is available in different formats. There are CDs and yet it can also be downloaded to your phone and/or computer. That there is dialogue between a learner (like me) and the native speaker. The phrase being taught is broken down into pieces, including a slow version and a fast, realistic version, that give the learner a chance to break it apart and hear all the elements of the phrase. The great potential of learning using this technique because music is such a big part of my life, and because there have been studies that show and support that this type of learning has great merit and success. This is a very mobile application. I have it downloaded on my phone and able to multitask when I am out for a walk or a jog! I like that flexibility and versatility – I don’t have to be sitting in one place or focusing on a page in a book. That you can download a free demo to see if you are going to like the format. That the scope of phrases and words included were focused more on the tourist and surface level conversation. While that might be a positive for some people, I am looking for something a little more complex and complete. I think the target audience for this product would be tourists. The words and phrases taught are helpful in navigating about in a foreign country, i.e. ordering food, finding the restroom, getting directions. The upper levels are helpful for those wanting a little more. This technique of using music to add a level of association helps move the learned words and phrases from your short term memory deeper into your long term memory as well. By utilizing music and rhythmic patterns, the learner is able to learn and recall learned material much quicker. I can’t comment on this because I did not have need of support nor did I look for options available. I did notice that there are FAQ and contact information available on the earworms website. The basic price is $13.50 per volume for MP3 download or $21.73 per volume for audio CD and printed phrasebook. Each language has two or three volumes. Very reasonable for what you get – a CD and book, or downloadable materials. 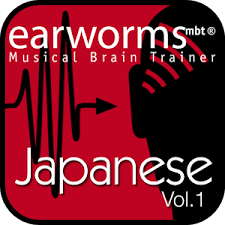 If you are looking for a fast start, Earworms Musical Brain Trainer is the program for you. This was an enjoyable way to learn a new language. It may not be the only technique you will need, but it is a good one to add to your arsenal. You earworms review is very comforting and leaves me with the idea it would be a good thing to invest in for basic language development. Earworms is currently available in 16 languages; at last check, Rosetta Stone is available in 29. More important, however, is: Are they available in the language you want to learn? If you are looking for a particular language, feel free to add another comment or send me an e-mail and I’ll tell you what products I am aware of in that language. If I understand correctly. The principle is to play the sounds in your head all day, night and the words will stay. I’m not sure about this. Is the music over the words or vice-versa ? You can see that I’m a novice at this type of language learning. The words are in rhythm with the music. The tracks are quite catchy, like a song that sticks in your head. I’m often surprised when I hear a song on the radio which I haven’t heard for many years, yet remember the words almost perfectly. That’s the principle at work. However, if you’re skeptical, why not try a more traditional course, like Rocket Languages for example.